Vegan Dance if you want to. : Snow Day! Warm up with a vegan hot toddy. Snow Day! Warm up with a vegan hot toddy. Technically the office was open today, but I really needed a snow day. Justifiable since I couldn't actually get out of my apartment until someone came by to shovel the snow from my blocked doorway. Anyway in between cleaning out the pantry and reading some Chelsea Handler, I thought this scene (me in my PJs on the couch with the ipad) would be a whole lot more sophisticated if it included a nice hot beverage. The unopened bottle of kahlua I found at the back of the pantry was a bonus. When choosing your boozing for your vegan hot toddy, you can always check out barnivore for the latest in what's vegan and what's not. In a medium saucepan, mix cocoa with soymilk and heat, but do not boil. 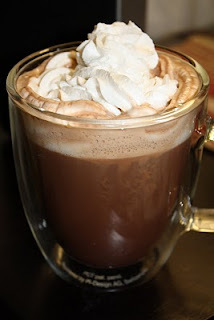 Add a generous splash of kahlua to a large coffee mug, add brewed coffee halfway, fill to within 1/2 inch with hot cocoa, then top with whip cream. Yum. Looks like a warming cup of joe! I'm a little late to the party but... I just made this tonight (with almond milk and vanilla coffee) and OMG was it ever good. Mosetta Stone: Decryptin' Recipes Left and Right, Sucka!